I thoroughly enjoyed the book ‘The Architecture of Happiness’ by Alain de Botton and when I saw his newest title, ‘Art as Therapy’ in my local bookstore I knew I had to read it. The book questions the way art is presented, amongst other issues. One concern is how we might understand and enjoy more of art if it wasn’t labelled by the artistic period, historical journey or style, and other information that assumes we have a prior knowledge or interest in art history. De Botton speculates as to whether we could connect with art more if its positioning took advantage of our everyday understanding and feelings. De Botton is going so far as to actually engage several museums and he will reorient, reclassify and relabel works of art. Unfortunately this will not be local to me, so I will have to hope for a web or print presence later. There are of course several examples in the book but one really struck me. I am not much of a fan of paintings of the ‘Madonna and child.’ The plethora of such images and the religious tone, has always prevented me from even bothering to look at these works. The painting discussed is called ‘Christ appearing to his mother, 1496′ by Juan de Flandes, you can see it and read the label that accompanies it here… http://www.metmuseum.org/collections/search-the-collections/437489 Not exactly scintillating prose it is? De Botton’s suggested label talks of the history of the relationship of the subject with the world and this shocking encounter with his mother. It runs to four paragraphs the last of which says… ‘The picture makes the claim that such moments of return (and survival), though fleeting and rare, are crucially important in life. It wants men to understand- and call- their mothers.’(de Botton, 2013) It’s on page 91 of the book if you want to check it out in its entirety. After I read this I looked at the painting once more and because I had emotional information to go on I found it easier to find a connection. It tapped into my role as a mother. Could I see the things suggested in the image? Could I feel the emotions now I understood the history of the relationship pictured, rather than the location of the painting? Could I now connect with the art? One half of me feels that perhaps if I wasn’t such a simpleton when it comes to traditional art I wouldn’t need to be so forcefully led to even think of really looking at this image. Everyone knows that if you have to read the label you are not looking at the work carefully enough. The other half of me acknowledges though that art is for all and what is the point of people going to the museum and not being able to really interact mentally with what they see or even worse not going because they lack a scholarly intellect. Remembering, Hope, Sorrow, Rebalancing, Self Understanding, Growth and Appreciation. Whilst I generally agree that art can do this and in fact does this for me through my own photography I am perhaps leery of the idea that art can be clearly categorized under these labels. Which is what de Botton intends to do in the upcoming museum curations he will do. Who is to choose what quality each artwork carries? I may look at an image and be filled with sorrow whereas you may look at the same image and be full of hope. Does this mean that the artist’s work is not good, if it is not clear enough to be read by the viewer? Maybe. It could be though that we bring such cultural baggage with us that we may not recognize work from different cultures or times or in fact our own life experiences and concerns may just be pull us in a different direction from other viewers looking at the same work. I recently asked for comments on several photographs of mine hoping to validate my experience and reason for making the image. Looking at them without any outside information I found that observers are just too individualized to all have the same reaction and in fact the participants had very different thought processes, life experiences and therefore reactions to each image. I also found that specific colors and lack of a human presence triggered specific cultural responses. Simplistically put for this image as blue equals sad and empty means lonely. The image below carried negative connotations for some , one made a witty comment and a couple understood the meditative aspects of the spaces pictured as being positive. As de Botton noted in ‘The Architecture of Happiness’ ‘We seem incapable of looking at buildings or pieces of furniture without tying them to the historical and personal circumstances of our viewing; as a result architectural and decorative styles become, for us, emotional souvenirs of the moments and settings in which we come across them.’ (de Botton 2006). Applying our own set of experiences can from one person to another twist the emotional response. Here is my photograph and below a few of the comments it inspired. How do you feel about this image? the blueness, the anger, the hopelessness of my soul. hoping for a freer life. in the blue room of my mind. and her empty jug awaits its fate. singing silently of hours at the easel. The surrounding blue is an extraordinarily intense combination of azure and turquoise – an essence of the Mediterranean and North Africa. 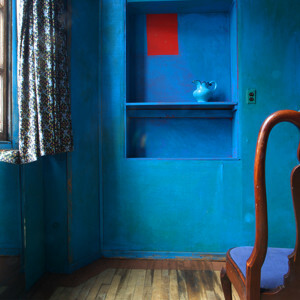 I think sitting in the room would be a form of colour therapy – I imagine being bathed in the intensity of colour, with the life force seeping down to my bones and warming my blood. Coordinated by Kathy Tycholis at the Richmond Art Gallery, British Columbia in Canada. An online gallery of all the works will be up in January. I enjoyed reading this. Have been thinking quite a lot recently regarding “Madonna and Child” and this was emphasised by my visit to the Representations of Motherhood Exhibitions at The Photographers Gallery and Foundlings Museum. Comments are always made regarding contemporary images referencing the classical Madonna and Child and yet, surely, those classical images are representing real mothers and the way they hold their infants. 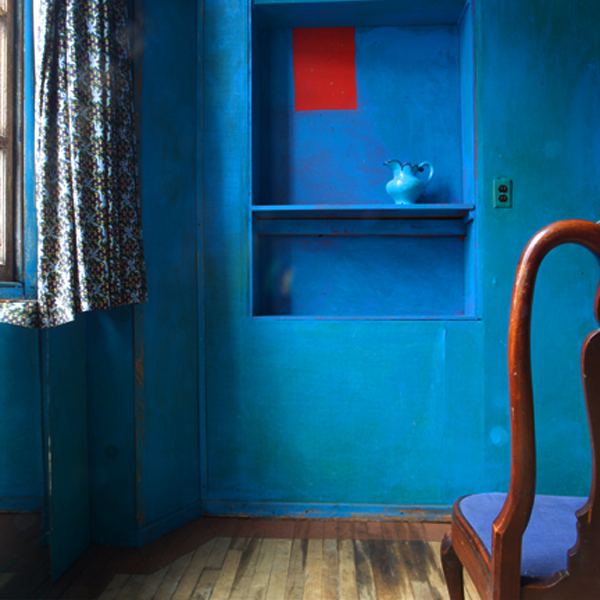 Your Blue Room still looks wonderful. I feel the same about religious paintings I find them hard to look at for long. I will walk in to a museum and quickly walk past religious paintings looking at them briefly. I see the quality of the painting but have no interest in the religious imagery as I feel no connection. It was interesting what was said about giving the painting a more personal story as soon as you said that I looked at the ‘Christ appearing to his mother, 1496′ painting and I was able to look at it in a different way, without the religious side clouding my view, but my change in understanding was due to a description which gave the painting a more personal feel. If De Botton categorizes art under Hope, Sorrow, Rebalancing, Self Understanding, Growth and Appreciation I am not sure if these simple words would make me look at the paintings, photographs & sculpture differently. Art I agree can be too complex to categorize. The artist or viewer will not have one emotion in mind when producing their work or viewing the image. I look forward to finding out how De Botton deals with categorizing his future museum curations.